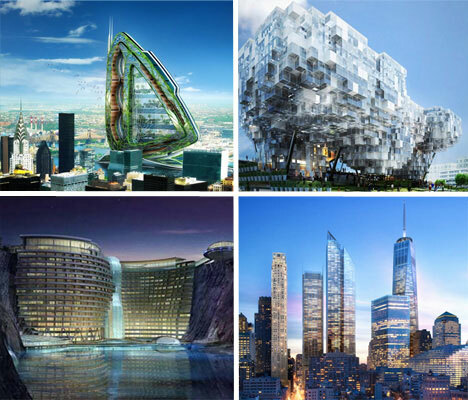 Bold, bio-inspired, vertical and sustainable: those are the traits that architecture of the future will share, if you go by the trends in current cutting-edge concept designs. While some of these architectural concepts will never become reality, others are already in progress or slated to begin construction soon. From a sparkling urban farm inspired by a dragonfly’s wing to a dystopian concept that embraces genetic engineering, here are 12 amazing designs that give us a peek into what the future may bring. The Songjiang Hotel by Atkins Design makes use of a beautiful water-filled quarry in the Songjiang district just outside Shanghai in China. 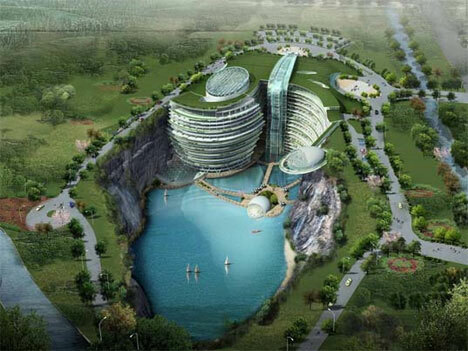 This innovative design features a green roof, geothermal energy and underwater areas including a restaurant and guest rooms. The quarry provides an ideal setting for sports and leisure including swimming, water sports, rock climbing and bungee jumping. 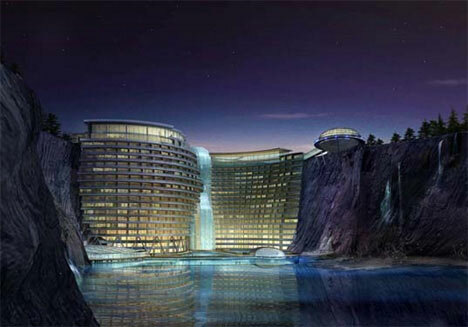 The Songjiang Hotel was originally slated to be completed by May 2009, but as of now it’s still just a concept. From Vincent Vallebaut, designer of the Lilypad concept, comes another stunning sustainable design that aims to meet the food, housing and energy challenges of the future. 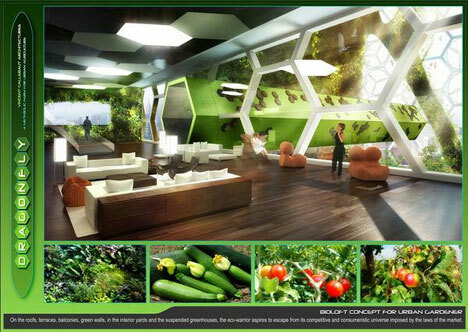 The Dragonfly is an urban farm concept for New York City’s Roosevelt Island, modeled after the wings of a dragonfly and designed to provide fresh, local food within an urban environment. 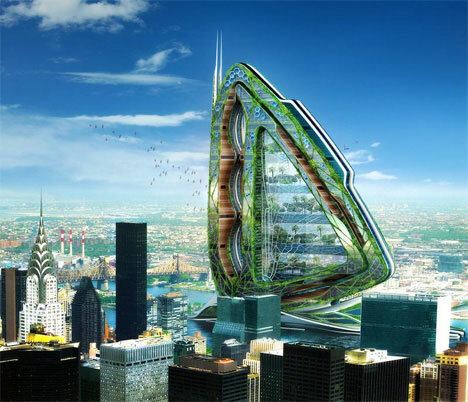 Fruit, vegetables, grains, meat and dairy would be produced on the Dragonfly’s 132 floors and the entire structure would be powered by a combination of solar and wind power. In order to survive global warming, the growing human population and other challenges in the upcoming centuries, some believe that we must start from scratch with a new model of human civilization that directs our technology and resources toward the positive, for the maximum benefit of the people and the planet. 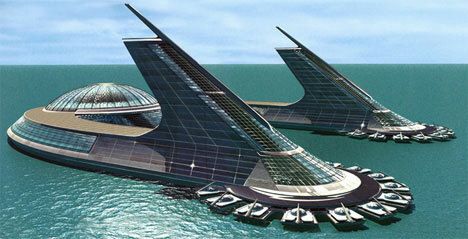 The Venus Project is a vision for a brand new world civilization and redesign of our entire culture. Circular cities with built-in farms and public transit, along with sea cities that can accommodate millions, are just part of this complex and visionary idea to take us “beyond politics, poverty and war”. By making apartment buildings entirely vertical, we could enhance the livability of urban residences and provide lush green gardens for each apartment dweller to enjoy. 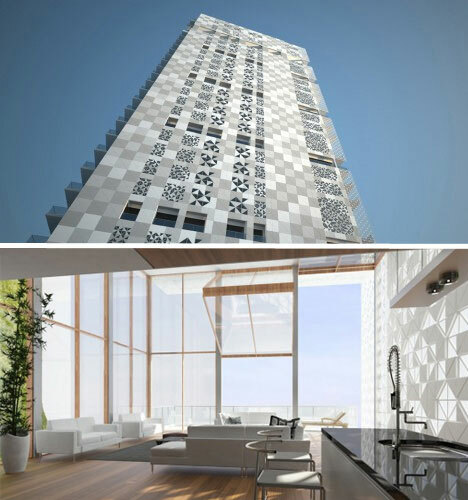 The Origami by Kann Finch, designed for Meydan City in Dubai, would give each apartment an open quality that extends the internal living areas to extensive balconies with uplifting window walls. A patterned solid/glass screen gives the building visual interest from the outside and provides shade and privacy for the residents. 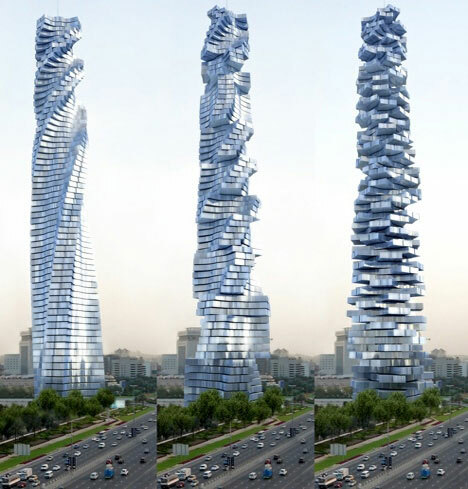 Italian architect David Fischer designed the Dynamic Tower Skyscraper so that each of its 80 floors would rotate according to voice command. Fischer wanted to design a space where you could enjoy the sunrise and sunset from the same room. The rotation takes up to 3 hours and is powered by solar panels and 79 wind turbines, with one turbine located between each floor. Almost the entire structure will be pre-fabricated offsite. Construction is due to be completed by the end of 2010. The Højblokka_PULS project by MAPT + DARK architects is another approach to vertical urban living, taking advantage of vertical space to expand the capacity of large cities as the population grows. 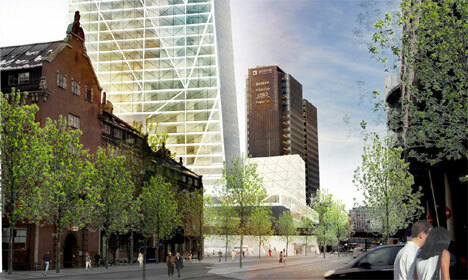 The idea is to have buildings with smaller footprints that is woven into the circulation of the area, combining office spaces, hotels, leisure and shopping facilities with sunlit public spaces in its low-rise urban block. MRDP Arquitectos, a Spanish design firm, wanted to create a space for fairs and exhibitions that would remain lively even in between events, maximizing the usage of the space. 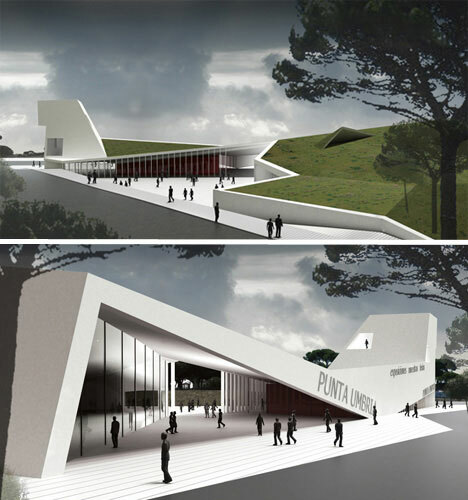 Their design for the Punta Umbria Pavilion is situated on an urban plaza and is contained under an expansive green roof covered in native, weather-resistant, low-maintenance plants. A 17m tower serves as a ‘lighthouse’ that provides views of the river and its surroundings. As cities become more crowded, green urban space comes at a premium. One idea for preserving recreation space in urban environments is the Sky-Terra Skyscraper by San Francisco-based designer Joanna Borek-Clement. 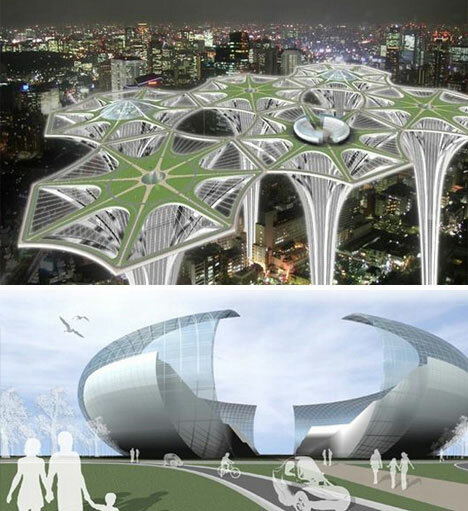 Sky-Terra is a neuron-like network of skyscrapers that tower over the city, bringing public parks, amphitheaters, fields and public pools closer to the sun. 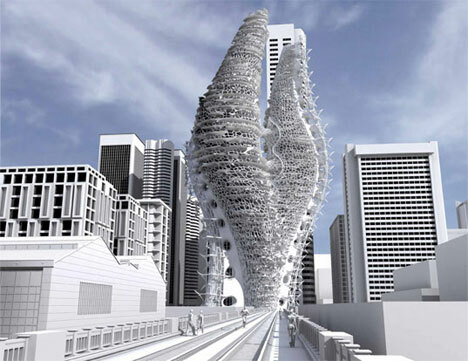 The inner core of each structure has elevators to transport people from street level to the top. New York was deprived of its Twin Towers in 2001, but it will soon have a whole new World Trade Center gracing its skyline. Made up of five new skyscrapers, a museum, a transportation hub, a retail complex and a performing arts center, the new design aims to make the World Trade Center a cultural and commemorative destination. 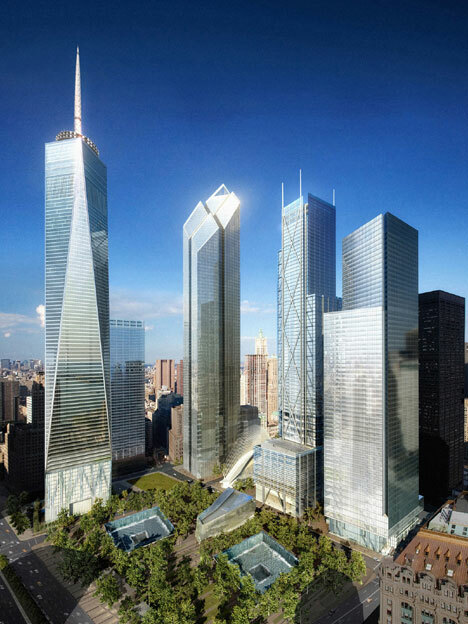 The memorial plaza is scheduled to open on September 11th 2011, followed by the underground memorial museum and Tower 4 in 2012 and the Freedom Tower in 2013. 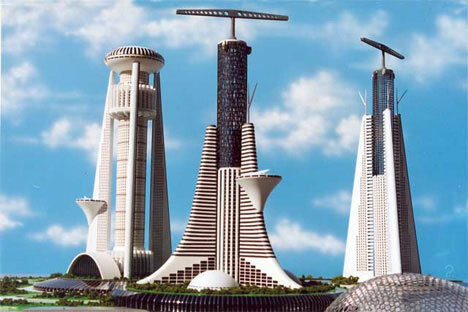 The economic meltdown has slowed progress and it’s unknown when towers 2, 3 and 5 will be completed. 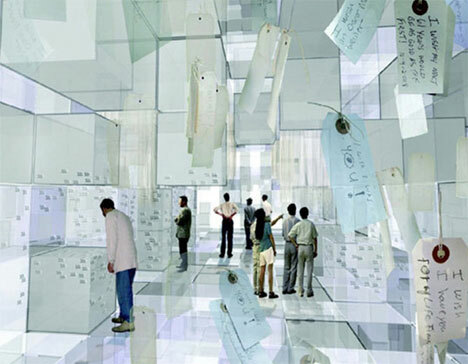 Singapore-based design firm Design Act created the ‘My Dream, Our Vision’ concept for the World Expo 2010 Singapore Pavilion Competition. 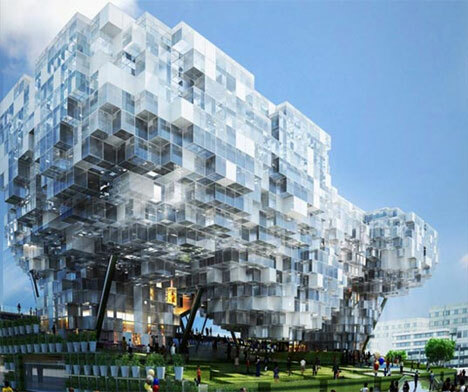 It uses permutated cubes to generate a pixelated-looking sculptural building that that looks like an illuminated ‘digital cloud’ hovering over a constantly changing green pasture. Designed to present Singapore as the ideal example of a city that can transform the lives of everyone who comes into contact with it, the ‘My Dream, Our Vision’ concept encourages visitors to post their dreams inside. Can architecture foster peace in the Middle East? 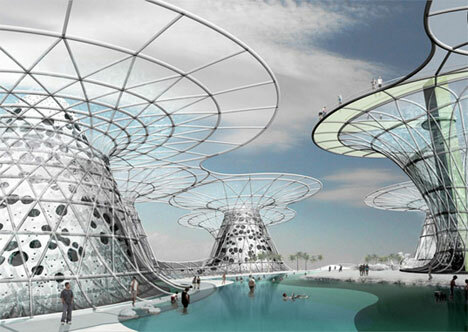 The No Man’s Land concept by New York-based architect Phu Hoang Office solves some site-specific issues such as friction over water control and also provides recreation, tourist attractions and renewable energy. The No Man’s Land design is made up of a network of islands, creating an artificial archipelago that actually extracts water molecules from the air to be desalinated, providing fresh drinking water. Resembling the nest of an insect, the Dystopian Farming project by Eric Vergne combines farms, worker housing and market places, mixing politically opposing classes – farmers and urban consumers. The idea is to reject the romanticizing of food projection and embrace genetic engineering, airoponic watering and nutrient technologies in a fully man-controlled environment in order to meet Manhattan’s food production needs.